Fire in a industrial unit in London, ¿What do we need to protect them against fires? Over a hundred firefighters are tackling a huge fire that has broken out in a warehouse in Tottenham, North London. 20 fire engines are being used to deal with the blaze on White Hart Lane. 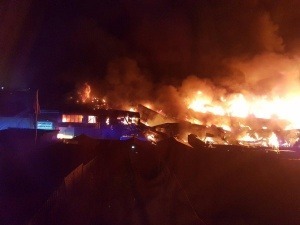 A London fire brigade spokeswoman said warehouse storage units were alight and officers were still trying to determine the cause of the fire on Monday. London Ambulance Service said one patient had been taken to hospital with burns to the hand. “We sent two ambulance crews, an officer and members of our hazardous area response team to the scene. One patient has been treated and taken to hospital with burns to the hand and we remain on stand-by at the scene.” The injuries are not thought to be serious, he added. Twitter users have uploaded videos showing the building engulfed by flames, and plumes of black smoke are visible across large parts of north London. At least 60 high-rise buildings across the UK have failed safety tests in the wake of the catastrophic fire that swept through Grenfell Tower in West London on June 14. Moreover, the government announced plans to carry out tests on 600 buildings across the country. That is why there is the necessity of doing something in order to prevent this fires from happening. The most delicate point in this issue is the wall that divides the two units or “partition wall” and within this element, the most exposed part to the flames is usually the covering connecting this two units.